Dow Chemical is sponsoring the environmental awareness program The Blue Planet Run, and teamed up with National Geographic to produce the Dow Water Map on its site and in advertising supplements to the magazine. The program is the next phase of Dow’s fascinating “Human Element” campaign. 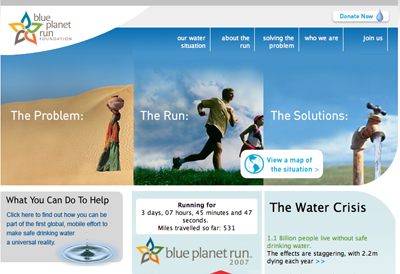 The Blue Planet Run began June 1 in New York City and features an international team of 20 runners running for 24 hours a day in 10-mile individual segments for 95 days, raising both money and awareness for the cause of safe drinking water. An interactive version of the Dow Water Map is on the National Geographic site. Clicking on one of the countries brings up a summary and pictures of that country’s problems with safe water, how they’re being addressed, and the number of people affected. The campaign brings the issue close, and gives a chilling view of worldwide fresh water issues and shortages. Also chilling is the fact that Dow was the sole manufacturer of Napalm and, a leading manufacturer, with Monsanto, of Agent Orange during the Vietnam era. That is one sharply dressed pig!